H&R Block Teacher Discount – Get 25% Off! If you are looking for the best H&R Block teacher discount, you have come to the right place! Firstly, if you are an educator with simple taxes,you can have your taxes done online with H&R Block for Free! For example, if you you rent your home, have kids, and have a W-2 the free version should be fine for you. 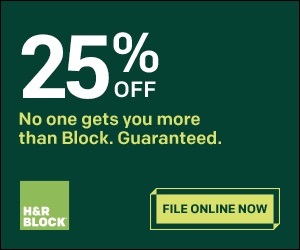 On the other hand, if you have a more complicated tax situation, you can take advantage of your H&R Block teacher discount for 25% off. H&R Block offers educators unlimited help via live chat. Other benefits include no hidden fees. Furthermore, H&R Block guarantees you your biggest refund! H&R Block Teacher Discount – Get 5% Added to Your Refund on Amazon! One cool feature of filing with H&R Block is that you can get all or part of your refund as an Amazon gift card. If you go for that option, Amazon will give you an additional 5%. For example, say your refund is $100 this year, Amazon will give you a $105 gift card! If you have a $1000 refund coming, that could be an extra $50 for school supplies! H&R Block Education Discount – Start Filing Today! In conclusion, the H&R Block education discount for teachers is definitely worth checking out! H&R Block has been a favorite of educators for a long time. You will be in good hands if you file your taxes online with them. If you are looking for general teacher tax tips, be sure to check out our article 8 Tax-Saving Tips for Educators. If you are interested in comparing TurboTax for Teachers, see the current TurboTax education discount here.